CD review: "Sweet Bitter Blues"
This review first appeared in the November 18, 1994 issue of the North County Blade-Citizen (now North County Times). Many have tried, but few blues duos have captured the exuberance and artistic tension of Sonny Terry and Brownie McGhee. Ever since Terry and McGhee's celebrated "comeback" during the folk revival of the 1960s, guitar-harmonica duos have been a staple of the blues scene. 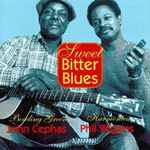 Few, though, have made it work as well (or as long) as guitarist John Cephas and harpist Phil Wiggins. This CD was originally recorded during several dates in the early 1980s, and was released in Germany  but not in the United States until now. While Cephas and Wiggins have grown increasingly popular on the blues scene over the last few years, this early recording shows they arrived on the scene already matured and fully developed. Neither Cephas nor Wiggins can pull off the kind of pure, high, wavering vocals that both Terry and McGhee excelled at. But both Cephas and Wiggins are instrumental virtuosos, and their music is a likeable blend of blues and folk in the same East Coast Piedmont style that Terry and McGhee played. Having played together for almost 20 years, the two men have a strong musical affinity for one another that is reflected in the easy give and take in their leads and solos.